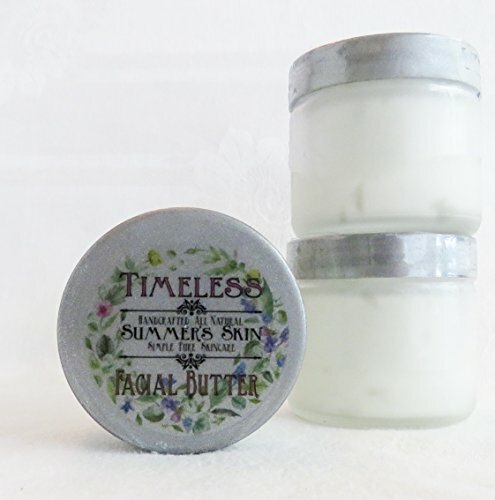 This rich , antioxidant and vitamin filled butter is made using only all natural shea butter and essential oils known for helping to relieve and stop wrinkles and the effects of time on our skin. Using twice a day helps stop fine lines and wrinkles, helps to repair some damage and does so without chemicals and pharmaceutical ingredients. It will keep you looking "Timeless"! 2 oz jar An all natural whipped cream to help fight wrinkles, fine lines and the effects of time! All of our products are made using only natural, pure ingredients, there are no fillers, drying agents, alcohols or water added. The results are products with different attributes than the average "store bought" skin care product. Please use our product very sparingly and allow a few minutes for the product to "sink" into your skin asit is actually absorbed and not evaporated. If your face feels "greasy" 2-3 minutes after application you have used too much Enjoy the skin health that our products bring through simple, pure, all natural ingredients and the essential oils that bring so many wonderful benefits, while using much less product and acheiving better results. If you have any questions about this product by Summer's Skin, contact us by completing and submitting the form below. If you are looking for a specif part number, please include it with your message.